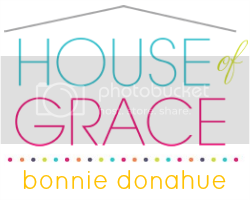 Honey Sweet Home: Drab to Fab Makeover: Hutch Love! Drab to Fab Makeover: Hutch Love! I used to think hutches were so dated, I could only imagine them in tacky old wood finishes that felt really gloomy and heavy looking. Either that or a little too country for my taste. But thankfully I’ve seen enough lovely ones to change my mind :) With a little inspiration, even a dreary old hutch can become a gorgeous addition to any contemporary design! It all started when I saw this piece sitting at my friendly neighborhood Goodwill. 1. I removed all the doors and hardware, then patched + sanded any nicks with wood filler. 2. 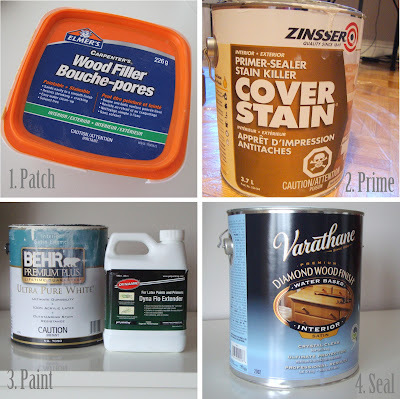 I primed everything with 1-2 coats of my go-to Zinsser Cover Stain - it’s my go-to mainly because I still have 1/2 a gallon to use up :) - but it adheres amazingly, even to veneers and glossy surfaces, which allowed me to skip sanding! 3. I painted the piece with 2-3 coats of Cottage White. Fab colour -not too yellow or pink or grey, just a really soft and creamy hue. To help minimize patchiness and roller marks I tried out a paint conditioner, which honestly worked wonders! 4. To protect and seal the piece, I went with a water-based product by Varathane - 2-3 coats, lightly sanding between each. I was really worried about finding a sealer that wouldn’t create a yellow tinge, after my experience with my white goodwill dresser. Helen from Picked and Painted suggested using a wax, but I didn't want to try it for the first time on this giant! So I asked for some tips at Rona, and the paint guy was awesome! He tried out a bunch of different products on a white slab for me, and to my eyes this one gave the truest clear coat. I kept most of the original hardware, simply updated the pieces (including the hinges) with a little Rub n Buff in Antique Gold. Since some of the pulls on the buffet doors were broken, I replaced them with matching knobs. To add a little interest to the interior of the hutch, I wanted to line the back in a really glamorous gold wallpaper. But that plan was a little too pricey, so I opted for this great Morroccan stencil by Royal Design Studio instead. LOVE it! The stenciling adds that glam factor I wanted and really makes the hutch pop! I was blessed enough to have this hutch sell pretty quickly, but I'm already missing it! What do you think? Looking at the pretty pictures makes me almost forget how exhausting it was :) Although next time I tackle a makeover like this, I may invest in a sprayer first. Any suggestions?! That is amazing! GREAT job!! That is STUNNINGLY BEAUTIFUL! Wow! Looks amazing! Would love for you to come by to link it up to my Creative Inspirations party happening NOW! I would love to have you there! Stunning!!! You did a wonderful job on this hutch. Oh my goodness!!! I have no words! Amazing!! You did way better than me!! I've never heard of a conditioner before! I will remember that if I redo a piece again. Thanks again for your sweet comment! Gorgeous transformation! I looks amazing. I love all the details. WOW! This seriously looks amazing...I've been considering painting my hutch, but thought white was too boring...not now!! Thanks! This is absolutely gorgeous! I almost can't believe it's the same hutch... I'd love to find something similar to attempt a makeover on, but much smaller... something so large would never fit in my teeny tiny bungalow. Thanks for the inspiration! gorgeous, gorgeous, gorgeous makeover! I love a classic white/gold combo. i seriously just died. AMAZING! I saw this at A2D. I'm in love... you did a great job! Just beautiful! WOW, that is a show piece now. This is beautiful! I like that you painted the hardware such a warm color to match. Exquisite! I would love for you to come link it up at my Thrifty Friday Party!! Hope to see you soon! Gorgeous Samaa! Zinsser cover stain is my go-to primer too. I just purchased the spray can version and it covers very well too. Perfect for small pieces. Love the stencil too, so classy! Beautiful! I love the stencil, adds such personality and glam. A lot of work, but it paid off so nicely! Gorgeous! You did an AMAZING job! I scored a dated brown hutch from Salvation Army a few months back. I can't wait to get started on it now. Thanks for the inspiration! Thank you so much everyone :) I'm so touched by all your super sweet words! Samaa, your hutch is beautiful. I'm a HUGE fan of gold and white! Ugh, it would have killed me to sell this piece of furniture. But there are more hutches to be found! Thank you so much for stopping by Project Queen. I'm a fan and follower of your blog now and I look forward to seeing what your next project is going to be. Wow! It totally love that!!! I really want to add a pattern to the back of some of my pieces, fabric or wallpaper seemed the way to go, but now I know stencil is a viable option! What an amazing transformation! I love the colors you chose! I wouldn't have thought to keep the original hardware but after you shined them up they looked great and very unique, I 'm glad you did! I love this hutch!!! I am going to message you because I have some questions....oh and thanks for the name drop ( I feel super special right now)!! Okay, well I can't figure out how to email you (without setting up a gmail account). Would you mind giving me your email? Thanks Saama! WOW!!! This totally encourages me as I too have a Mammoth hutch to refinish.Just gorgeously done! Samaa! This is amazing!! You're incredible...I REALLY need to get back to crafting but my cooking series has consumed most of my free time :) hahaha. SOON! PS--I'm sharing this with my FB fans today :). 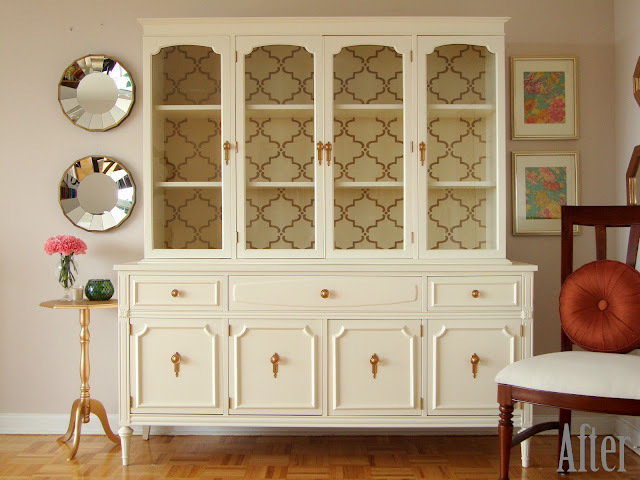 This hutch is totally gorgeous! You did an amazing job. All of the hard work was worth it I think. It's perfect! I've so badly wanted to rescue a hutch here and there, but the idea of dragging it home and around the house into my basement workroom, then back out when I sell it to someone, has kept me from it. So glad you went for it! And I love those round mirrors ... so posh. AMAZING!! you did a beeeeeeeautiful job!!! You sold it??? Wow, how sad you didn't keep it. I love every inch of it. I have a hutch sitting in my dining room as we speak just waiting for me to tackle. I would love for it to turn out like this one. I think I've found my inspiration and colors here! Wow Samaa, I think that is so very beautiful! I love the gold and white combo and this is a stunning transformation! Bravo girl! that is absolutely gorgeous, samaa! i love it!!! the design and hardware are perfection! Stunning!! Gives me motivation to dive in to my hutch I have for my bathroom. I love the cream & gold! I couldn't quite decide on if i wanted cream or not.. NoW I know I do!! amazing hutch transformation, I love it!! What a wonderful job! You have created such a lovely piece of furniture. We here in the UK would call this a Dresser. If anyone asked me to guess what a hutch was I would probably think the one you keep rabits in. Although we all speak English we don't always speak the same language, which I find fascinating. I love your Hutch / Dresser, you put such a lot of work into into it but well worth it. I just found your blog and I love it! You are very talented.. thanks for sharing! Fabulous, fabulous job! I'm in love with this piece. Holy mackerel, you had quite the vision!! It looks beautiful, and so sophisticated. I love it! wow, you deserve a medal and a marching band to celebrate the fabulous-ness of this makeover! I am so totally jealous and at the same time exhausted looking at the amount of work I know you put into this baby. It's BEAUTIFUL! Such an awesome transformation! Beautiful. And that little gold table! How darling is that? Where did that come from? Love it. I'm absolutely loving gold right now, and paired with the white it is simply stunning. Great transformation! Great makeover! Where did you get those circle mirrors besides the hutch? They are gorgeous. Thanks so much Emily! I really appreciate it :) I actually found the mirrors at my local Homesense (the Canadian version of Homegoods). The same mirrors are sold at Ballards too, as well as Pottery Barn, although not at quite the same pricepoint unfortanately! Another blogger mentioned that she found them at Kohls as well. ummmm ..that is amazing. Very lovely, great job! Congrats to you for being featured on Centsational Girl BOTB! I just came over from CG and I LOVE this makeover. I can't wait to see your other projects, so I'm off to take the tour around your blog! Wow, this is really beautiful makeover!! You must be proud! Thank you so much! I do love it :) I felt a bit insecure about some of the imperfections in my paint job, but all this support has been so amazing! This is very lovely! You did a great job! I wish I had a hutch to makeover! You've inspired me to try this to my old and dated cabinet. Thank you. This is absolutely beautiful. We inherited an old French Country-ish hutch from my husband's grandmother, and it needs a LOT of work and a paint job -- but it just seems like such a daunting task! You are an inspiration -- you did a fantastic job! My sister's new boyfriend has a sprayer, she really hit the jackpot on him! Someone that can be of some use to us in our insane amount of projects. I'll ask him which one he has and return with feedback. I am not surprised that it sold so fast or that you are missing it. It looked great. Get the sprayer and do another. Thank you so much Helen! I may just take your advice :) I'd love something similar, maybe just slightly smaller, to keep for our home. This is just gorgeous!! Thanks for all of the pictures and details on the transformation....love how you share, it really is fun to see how it transforms. I love the gold finish too. I forget how great the rub and buff make some pieces pop! I do have 2 questions/comments~~~ I am surprised when I read your posts and see where you say you had to sand after painting with the chalk paint. I thought the beauty of chalk paint is that no sanding is needed. Also what ‘wax’ do you use as a finish on your painted pieces. thanks and can’t wait to see future pieces! This is so beautiful! I love the stencil! This really looks amazing! I'm so jealous! Love it and love how you've set it up! This is absolutely perfect! How not to love this piece? Well Samaa, I was wondering if you're interested in guest posting at my blog Stardust. I host a guest blogger every Friday, so shoot me an email if it's a yes, to schedule a date! gorgeous! What a find and what talent! great job! This hutch is stunning!!! Such a great job and an amazing improvement. Hi. Could you please tell me where you bought Rub 'n Buff? Hi there! Sorry to be replying sOo late - I actually purchased my rub n buff online off an ebay seller - she had the best shipping rates to Canada. I think in the US you can find it in stores but here in Toronto I couldn't find it in any art stores. Wow, this is beautiful! Amazing job!! I love the stencil idea and the styling around the hutch is beautiful too! Ohh Ahhh, I love it, and that little gold table too! You've really done a beautiful job with your hutch! I've got this linked to my dining room hutches post too today, for inspiration! This is a fantastic transformation and is giving me the courage to get to mine after two years of living with it in it's not so lovely wood finish. :) Great job! Thank you so much Allyson - I'm so happy you liked it :) Can't wait to check yours out! Where did u buy the stencil from? 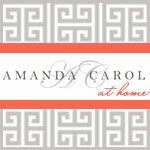 They also have a lot of other great options, and if you check on blogs like young house love or vintage revivals they have 10% off coupon codes! This is so amazing! I came across your blog in today's Star. Love it! I have an old wooden buffet in my basement and this is the perfect makeover for it! Thanks for posting! Beautiful! I was wondering if you have had any yellowing from using the Water Based Varathane on white? Thanks! Gorgeous! Just the tutorial I was looking for to transform my 2nd hand hutch. :) Thanks! WOW, this is totally amazing!! Just saw it on AT and pinned right away, so impressive!! I'm inspired now to find something like this and make it work in my more modern home! Thanks so much Suzannah! I miss this piece so much, sometimes I regret selling it - I've been on the lookout for a similar hutch ever since! MashAllah... a job well done... question would your primer work with the ikea type wood??? Thank you so much Hira! I really appreciate it :) I painted the back panels of some Ikea bookshelves with this primer and it worked great, they were a very smooth laminate material. I haven't tried it on any Ikea wood products yet, but I have used it on a few pretty glossy/laminate surfaces and it's always worked well, so I would definitely think so! I'm in love and inspired! I bought a hutch today and I'm going to follow your instructions and have my fingers crossed that my results will be close to as wonderful! One question, you mentioned that you use a roller, can you tell me more about that? Which one? Thanks so much! Oh thank you so much! And I'm so excited for your makeover - I'd love to see how it turns out! As for the rollers, I usually use the 4 inch foam rollers by Shur-Line, they're readily available at most stores near me and a decent price :) Hope that helps! I am not a fan of parquet floors. But if I had them, your refinished cabinet would rock. I love how they go together. But even without the floors - I love how you redid this cabinet, and then kept the backdrop simple with the moroccan pattern. Love it. All in all, it's a win. Thank you so much Michelline! I'm totally with you on the parquet floors, although our new place has mostly carpet throughout which almost has me missing those old floors and how easy they were to clean up! Thank you so much for the very kind comment Norma! I used the small moorish trellis stencil, it was 15.5" squared in size, each shape is around 7". It was a great scale size for this application - not too busy but just the right amount of pattern. They also sell a bigger version of the same pattern, I think that would look amazing too especially on a larger surface like a wall. I'd love to see what you end up doing!